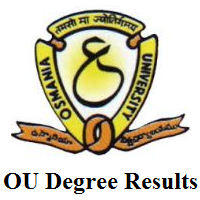 OU Degree Results 2019: The higher officials of the Osmania University (OU), Telangana are planning to release the OU Semester Results 2019 in February 2019. And these B.Sc, B.Com, BA, CBCS 1st, 3rd, 5th Sem Exam Results are about to release for the held November 2019 examination. So, candidates who have attempted the test for the B.A, B.Com, B.Sc, BBA, BSW courses are eligible to check out the ఉస్మానియా విశ్వవిద్యాలయం UG I, III & V Semesters Results 2019. Moreover, the OU UG Results 2018 are published at Official website @ osmania.ac.in as well as other private websites i.e., schools9, manabadi, indiaresults, vidyavision etc. And also, candidates can find more information on the OU Grade Awards, Osmania University UG Exam Results 2019. We have also given you the instructions to check out the OU Degree Results 2019. Also, click on the direct link given at the end of this page. 1.4 How to Check Osmania University Degree Results 2018-2019? The officials of the Osmania University are ready to release the Osmania University UG Exam Results 2019 in the month of February 2019. And they are releasing the OU Degree Results only for the below examinations. Remember, that only candidates who have given their part in the November examination are eligible to check out the results. The OU Grade Awards are given as per the rank wise, the highest Grade O which is referred to as Outstanding Performance in the Examination. And they have announced that the Least will be F, which is of 49-40 only. So, candidates who are about to check the OU GRade Awards, OU Degree Results can check the below table. The OU Semester Results for the below groups will be released by the officials. How to Check Osmania University Degree Results 2018-2019? Strive to the official website of Osmania University @ osmania.ac.in. Or you can click on the Osmania University UG Exam Results 2019 link which is given below to this page. And then choose Your Group BA, B.Sc, B.Com, BSW, BBA. Now, candidates need to enter their accurate Hall Ticket Number. After that, you must verify your credentials to submit the form. Soon after submitting the page, you can see your OU Semester Results 2019. Later on, check your result available on the screen. Furthermore, you need to download those OU Degree Results 2019 and also take 2-3 printed copies of it for further reference. We hope that all the candidates have gathered and notified the exact details of the OU Degree Results 2019. And the link will be activated when the officials release them out. Follow us on Freshers Now page, so that you can get all the latest updates and exciting news of the Exam Results, Syllabus, Previous Papers and many more.